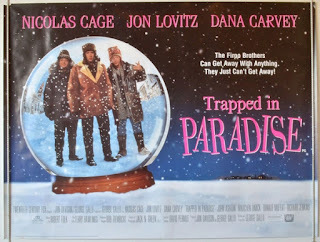 Trapped In Paradise deals with three brothers namely Bill, Alvin and Dave played by (Nick Cage, Dana Carvey and Jon Lovitz) who rob a bank in the small town of Paradise and from then on through a number of trials come to understand that what they did was wrong and change their evil ways and are rewarded for it. On the surface you can easily see the appeal during the holiday period as bad guys (but not really) meet good people who by example bring the antagonists back to the side of goodness. Of course this is comedy and relies a little too much on the usual sticht of Dana and Jon with Nick as the straight man, it doesn't always work and that is where the movie falls a little flat. The support cast is excellent though with some great performances both in the emotional sense and the humour and I would say adds more to the movie than the main cast. I'm not going into any specific plot points even though this movie was released in 1994 because my guess is that this probably passed you by even in the great days of video rental and for the last few years anything with Nick Cage in the credits (barring established hits) seems to be avoided by the mainstream audiences. 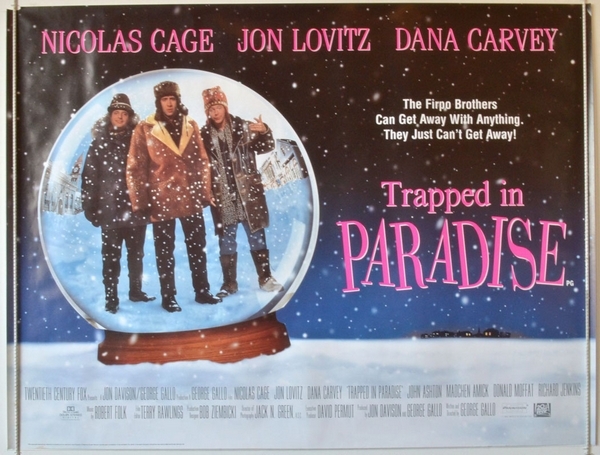 Trapped In Paradise is not a great christmas movie despite some very familiar themes, it's not a great crime caper or fish out of water comedy either but overall it kinda works and is certainly worth a watch.